I had a few hours and a three-year-old helper this weekend, so I finished the decking for the playground. 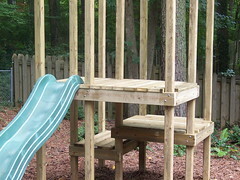 Next up are the rails and balusters to prevent young’uns from flinging themselves off the upper levels. I’m about halfway done getting concrete into the post holes – this weekend I’ll finish the job then I can take off the temporary framing. Wah! It’s raining today (Saturday) so I can’t work outside. 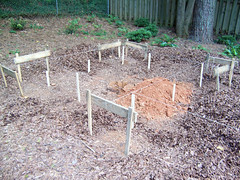 I did pick up some gravel for the post holes. Oddly enough, Home Depot doesn’t have gravel (WTF? ), so I had to go to Lowes instead. I picked up 500 pounds of gravel for about $35. 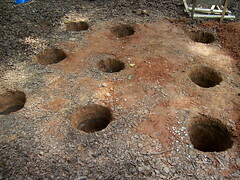 I’ve been digging post holes every evening this week, and I’ve completed eight so far. 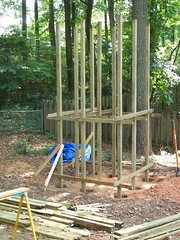 One more to go, then I can start setting the posts for the main play structure. I’ve never worked with concrete before, so that should be interesting. 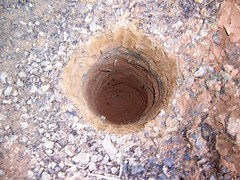 I’m fascinated by concrete, I think it belongs up there with other discoveries such as fire, the wheel, and computers. This weekend I cleared the area, set up some batter boards and string to lay out the posts for the central tower and get them perfectly square, then dug one of the post holes as an experiment (to see how hard it would be, and to determine if I needed to rent a power auger). A ten foot slide is pretty much as long as you would expect. Why is my visualization of ten feet so accurate while I woefully misjudge three feet?